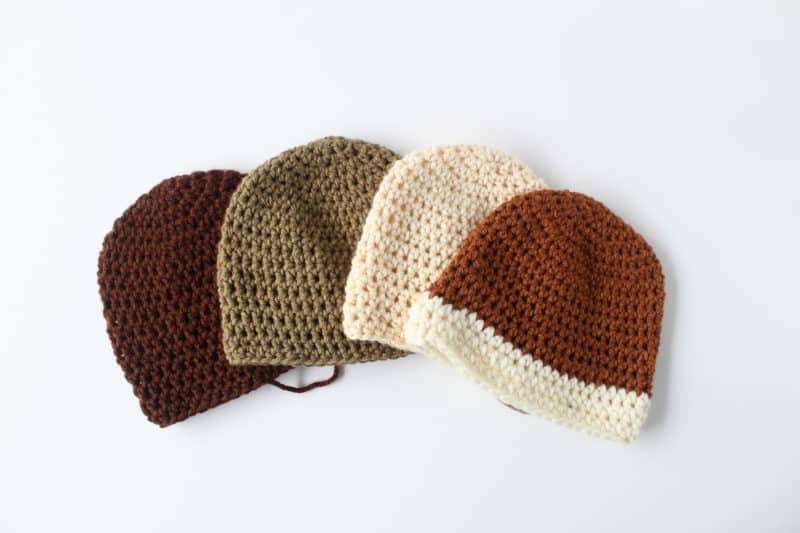 It’s beanie season and while I’ve shared a few beanie patterns, I wanted to talk about crochet hat sizes. When I started crocheting ten years ago, the first thing I made was a hat for myself. It was way too small and I ended up giving it to a baby niece! I kept trying though, and I made another hat for a friend, which was still too small. I made three hats for that friend until it finally fit. Since then, I’ve made dozens of hats and beanies that fit every single time, on the first try. I’ve learned how to perfectly size hats so that they always fit. 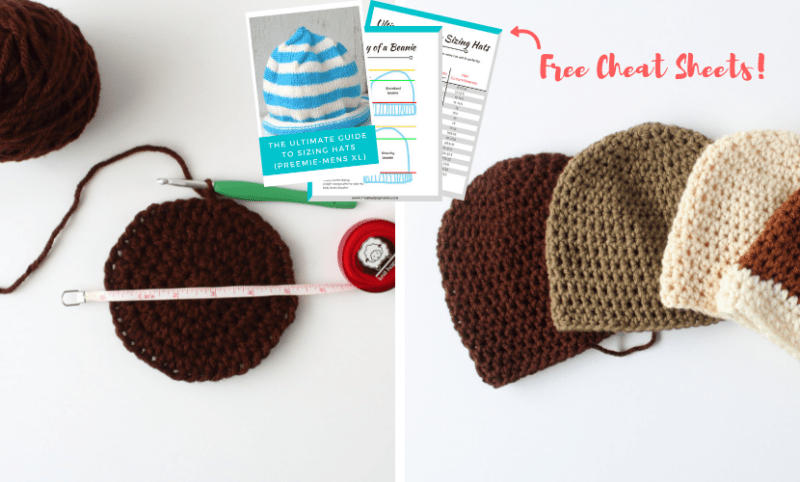 So today, I’m going to show you how to perfectly size hats in 3 easy steps and give you the freebie that I use for sizing hats. A hat has three parts: the ribbing (or bottom edge), the body, and the crown. 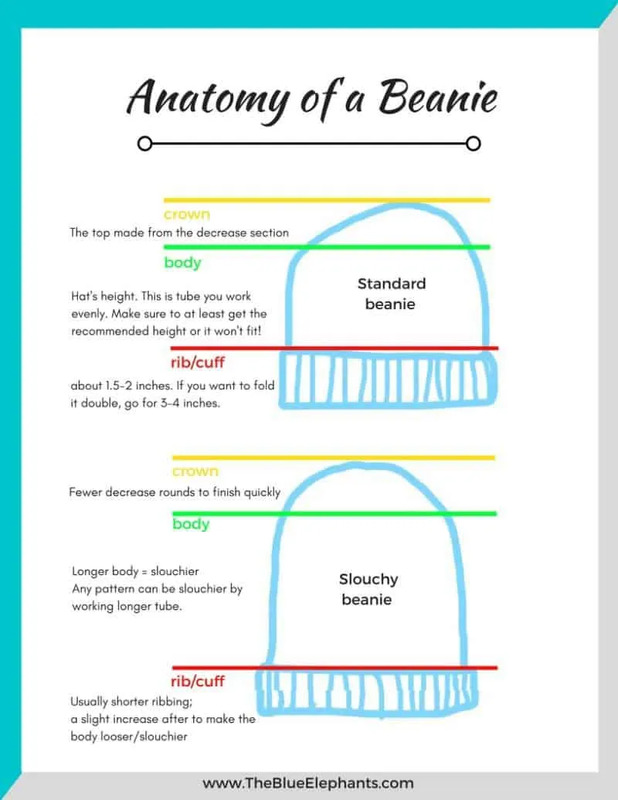 You can start and finish your beanies in any way you like, but it will always have these three parts, so this is what we look at when sizing. I’m going to show you how to size a women’s small hat and child’s beanie so you can see how to size both ways. 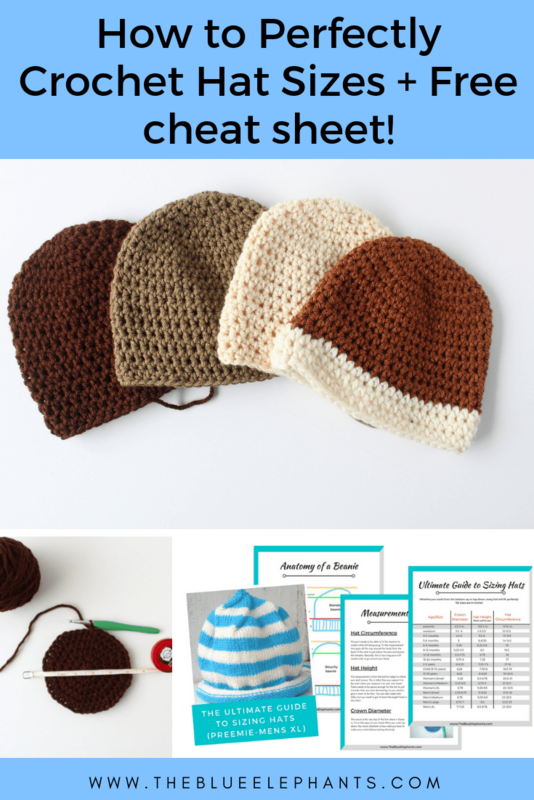 The Ultimate Guide to Sizing Hats is my free printable that gives you all the measurements you need to crochet hat sizes for anyone. 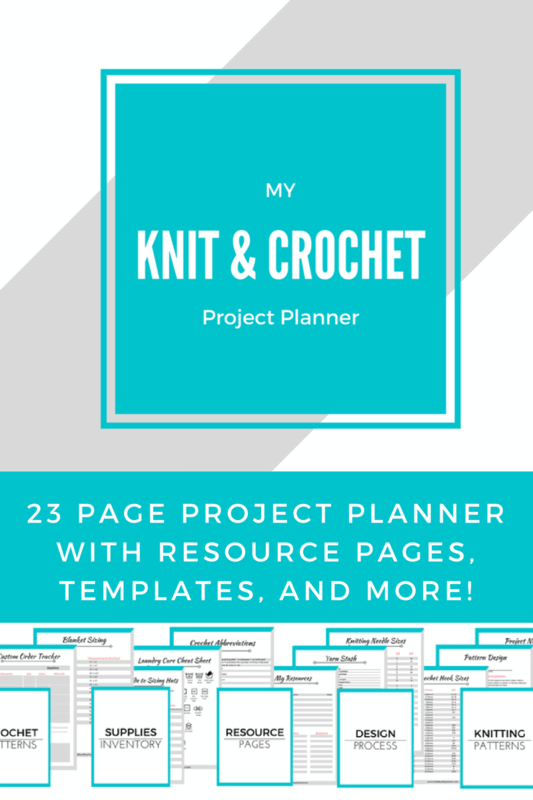 It’s available for free in the resource library and as part of my Knit & Crochet Project Planner, but more on that later. When you make a hat from the bottom up, you start by creating the ribbing or the bottom edge. This part needs to be able to fit the head at its widest while still being snug. This is the Hat Circumference. It’s the measurement that goes all the way around the head, from the back of the neck to just below the ears and across the temples. For a women’s small hat, this measurement is about 20.5-21 inches around. So start by creating a chain or casting on enough stitches to meet that measurement. Then, you can join to work in the round or continue working back and forth. This is the base of your bottom-up hat. 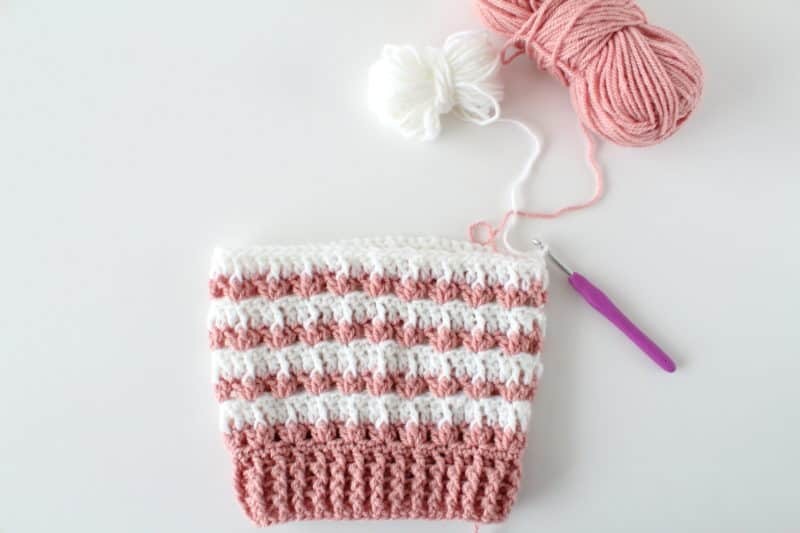 You can measure your own head and work to that measurement to make sure it fits you, or you can use the Ultimate Guide to start at the right circumference for any other knit or crochet hat sizes. The same steps apply for knitting too! After you’ve established the hat circumference, it’s time to work on the body of the hat. This is the height of the ribbing and the design of the actual hat. It’s everything except the very crown. This measurement is from the bottom edge to just past the ears. I always used to mess up here, because this is taller than you expect it to be, even when you measure it on your own head. 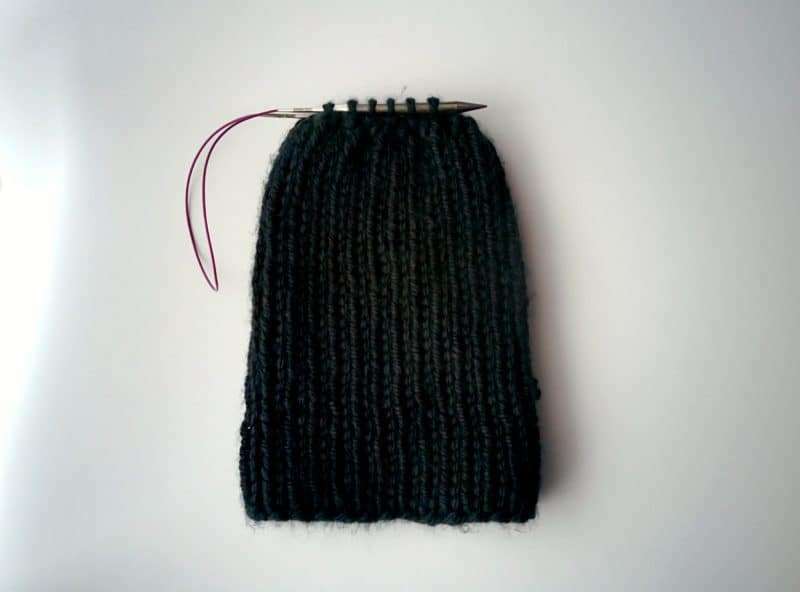 There needs to be space enough for the hat to pull inwards when you start decreasing, so you need to give it room to do that. When I measure from where I like my hats to start to the top of my ear, I get about 4 inches, BUT I NEED at least 8.5 inches for a women’s small beanie. So to make you hat sizes work, be sure to get at least the height listed on the cheat sheet. Make your ribbing as tall as you like and then start working the body of the hat without increasing or decreasing until you reach that hat height. Here are some example below. The first beanies I made, I thought that number looked way too big for a hat. I mean, who has a 9-inch head?? It took me a couple tries to realize you need space to work all the way up to the crown. And, as you can tell in my picture above, this way to figure out hat sizes works even if you don’t join to work in the round. All of these are hats from my blog and you can click them to go to the individual patterns. 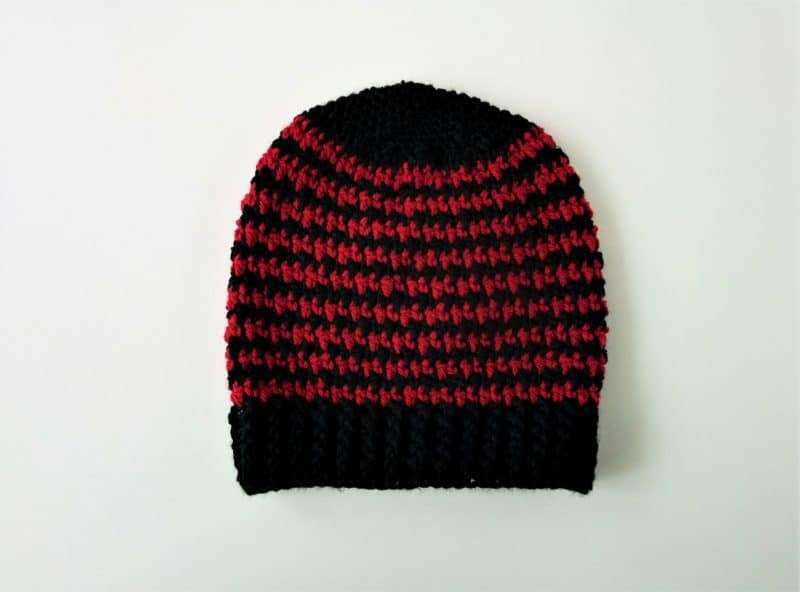 Next up is the crown of your beanie. 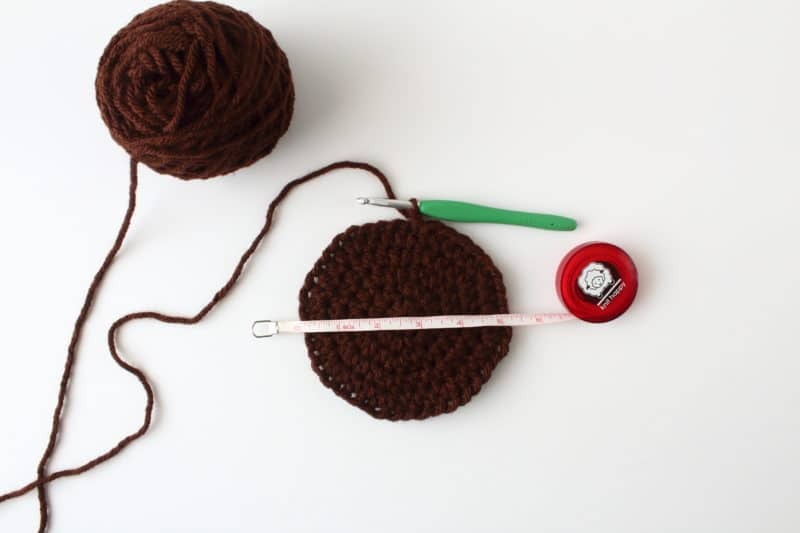 If you’re working from the bottom up, you’re done measuring for your crochet hat sizes. The crown is the very top of the hat where it closes in to make the dome. Once you’ve reached the hat height, you can start decreasing. All the rounds you work from here until the end will give you the right diameter for the crown. You don’t really need to measure this if you’re working from the bottom up. When you decrease evenly in the round, you’ll get the right crown diameter for your hat. You can check that number afterward if you need to. If you decrease 5 or 6 stitches in each round for the next 5 or 6 rounds, you should have a circle shaped crown. Or, you can decrease fewer stitches over more rounds to get a pointy crown. This is great for elf hats or something you want to extend a bit farther. When you’re done decreasing, just bind off and you’re done! Okay, so we talked about how to figure out hat sizes worked from the bottom up, but what if you want to start at the top and work down? It’s just as easy! This is what I love about the Ultimate Guide to Sizing Hats; no matter where you start, the measurements help you get it right every time, for every style. With top-down hats, you start from the crown by creating a circle. You want to increase until your circle meets the measurement for the crown diameter. For this, I’m making a hat for a child 9-12 months old. So, according to my cheat sheet, I need to have a crown diameter of 5.25 inches. Now place a marker at your last increase round. From here, you can work your pattern to the appropriate hat height. Remember how we talked about this being the body of the hat + ribbing? It’s the same as if you were working bottom up; just continue working evenly until you have the right height from where you marked the last increase round. 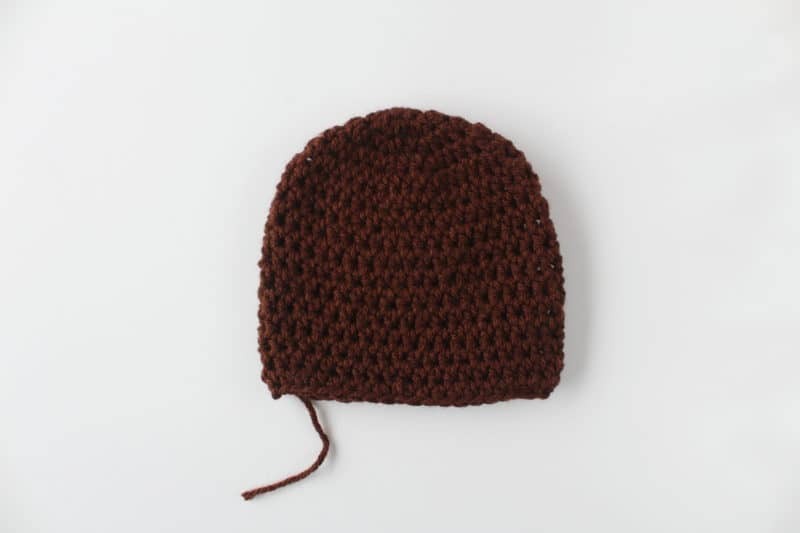 For a child’s hat, I would work until 6.5 inches. I could work that all the way down and skip the ribbing like I did with the hat below, or I can work for 4.5 inches and leave 2 inches for ribbing. It’s up to you how you want to get to that height. Lastly, you have the hat circumference. When you worked from the bottom up, you didn’t have to worry about the crown diameter because it already works out to the right size. Similarly, when you work from the top down, you don’t have to worry about the circumference. You already made the hat as wide as it was meant to be when you made the crown. You can double check to make sure though. For a child’s hat, it should be 15.5 inches around. Bind off and you’re done! Now you can make hat sizes perfectly no matter how you start! Now you know how to make the classic beanie and how to perfectly size hats that fit snugly. To make things more interesting, let’s look at a few ways you can use these measurements to create variation. 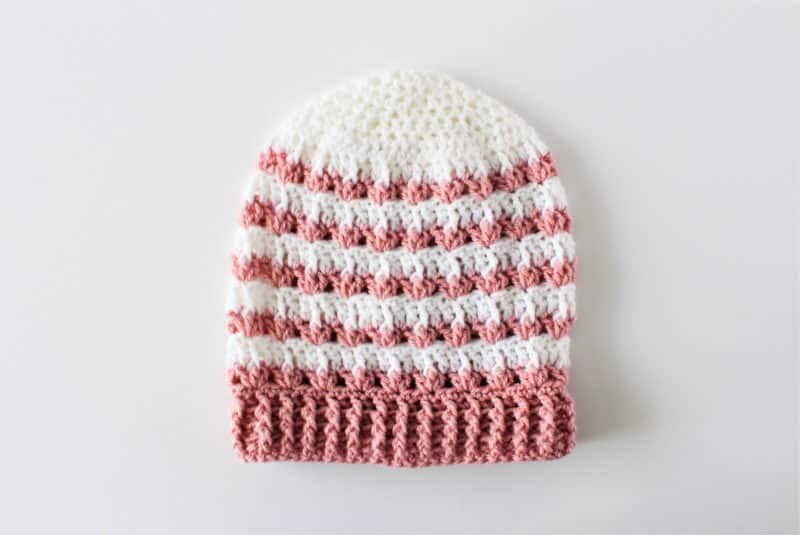 Slouchy Beanies: If you wanted to make your beanies slouchier, add another inch or inch and a half to the hat height. This will give it a little more room past your head to slouch. Pointed Hats: After working the body of the hat, add rows in between the crown decreases or decrease in smaller increments. This will add more length to the crown and still decrease slowly so you end up with a point. This would be great for Santa hats, elf hats, other character costumes. Berets/Tams: These types of hats are like slouches, but they have a wider body than the ribbing. Work the ribbing at the normal hat circumference, then increase a row or two before working evenly for the rest of the hat height. 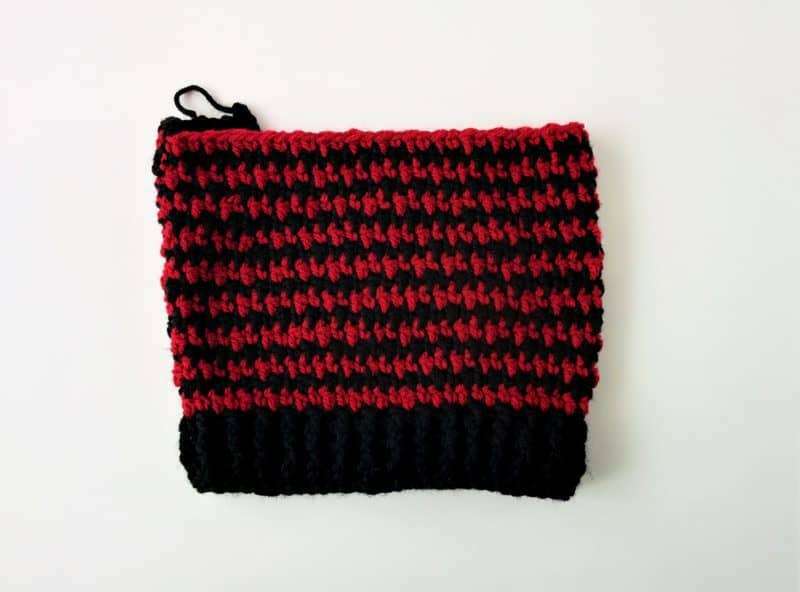 This will allow the hat to spill over the ribbing and create that beret look. Side to Side hats: If you want to make a hat in a long rectangle that’s sewn closed, start with a chain/cast on to the to total hat height plus 1/2 the crown measurement. 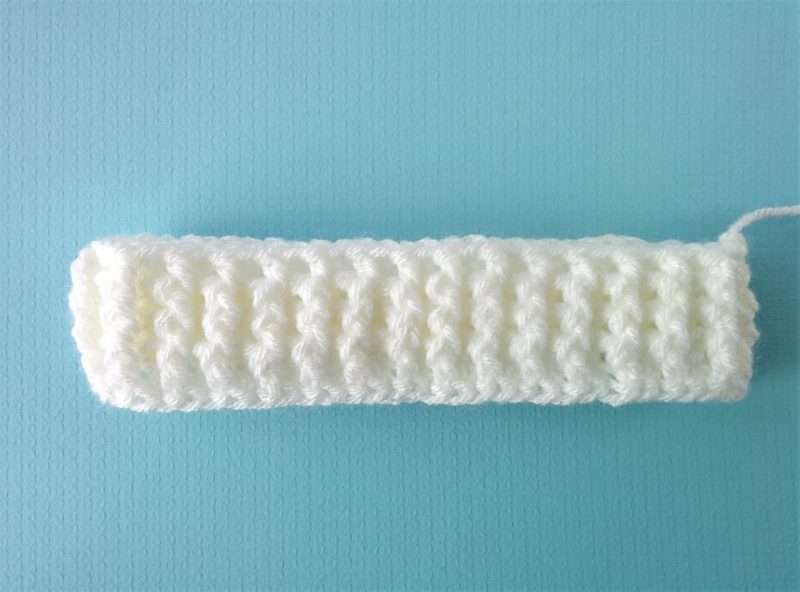 Then work back and forth until you reach the right circumference and sew the ends closed. Wow! That was a lot of information on how to crochet hat sizes, wasn’t it? It’s so easy to talk about and explain now that I’ve finally figured it out. I never have to second guess myself or wonder if the hat will fit the recipient. If I’m unsure of what size they need, I can always ask them to measure their head circumference and work from there. To help you, I created a cheat sheet you can print out for free! The Ultimate Guide to Sizing Hats has the measurements for 18 sizes ranging from preemies to men’s XL. I’ve pulled from sources all over the internet, found the average sizes people use and added sizes I’ve tried and used repeatedly. I’ve compiled all that into a free printable that you can pick up in the resource library. Just subscribe right here and you’ll get access to it! At the beginning of this post, I mentioned a planner. 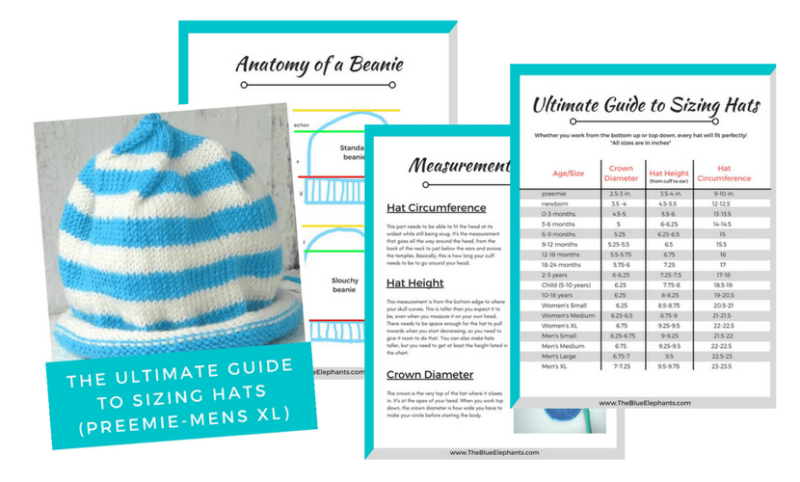 This is a 23 page printable that includes the Ultimate Guide to Sizing Hats, as well as tons of other resources. 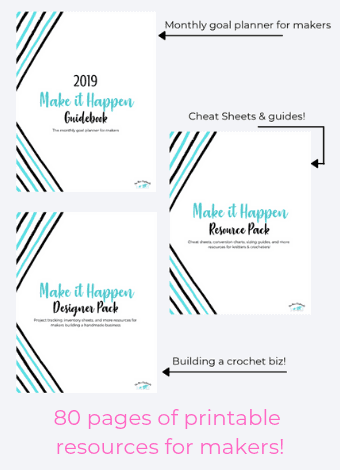 There’s a blanket sizing guide, a custom order tracker, pages to help organize your supplies and tools, pattern design templates, knitting and crochet abbreviation cheat sheets, and so much more. 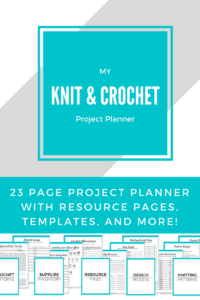 This is a planner that was specifically made for crafters in mind. You can find out more about it over in the my Etsy shop and take a look at some of the pages yourself! I know that was a lot, but there was a ton of information on this that I wanted to share. Beanies are some of my favorite things to make now, and I don’t think they should be hard to do. If you agree, then I absolutely recommend you get that Ultimate Guide to Sizing Hats. It’s free and it will save you so many headaches in the future. Thanks so much for reading.